Here you can view some examples of the extensive range of different glazing options and colours. These include acid-etching, opaque backing, bevelled fanlights, coloured fanlights and stained glass. Colours and styles change all the time and you should always check with your PlatinumNRG partner on the availability. 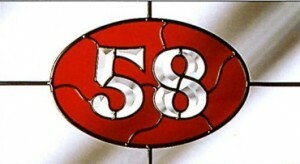 Why not discuss something bespoke like your number etched into the glass. We can also offer PVCu Triple Glazing for enhanced thermal efficiency and acoustics. Below are some samples of the various glass options. These images are only a representation of the original product. Products maybe discontinued without notice so please always check with your partner for current availability.